k9-Tactical Firearms is committed to provide the most professional and courteous customer service available. At this time due to limited supplies of firearms, ammunition and accessories we are operating on a "By Appointment" only method, so the best way to contact us is via email k9-tactical@yahoo.com . If you would like to speak with us, please phone us at (636) 219-3935 and leave a message, we will return your call as soon as possible. At K9-Tactical our mission is to get you the firearms that fits you and your needs, and properly trained in using a firearm both safely and proficiently. Whether you are new to firearms or have years of experience. Whether you want to just go out shooting with your family or for personal protection. We can and will make you better with a handgun. All of our classes are especially sensitive to those not familiar with fire arms regardless of gender. Minimum age is 19 years old if applying for a Missouri Concealed Carry permit and 21 years of age for the Florida permit. For Basic Pistol, Home Safety and Protection classes, teenagers with a parent or other adult also attending are welcome to enroll. The Fire Arms Safety, Missouri, and Florida Concealed Carry Weapons classes are all non smoking and a "Family Oriented" atmosphere. No egos, profanity, or windy war stories here. The classes are designed to be simple to understand, very interesting with the use of visual examples, plus real life scenarios and situations. 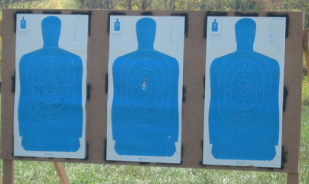 I guarantee you will get CCW training applicable to the real world and not just the target range. Generally all classes are 9+ clock hours and the cost is $135. for the Missouri CCW Class and Florida CCW class. All students must be able to demonstrate safe handling of all firearms, demonstrate marksmanship, loading, reloading (with both semi-automatic and revolver), and safe range behavior. There are a limited number of class firearms available for those not owning a firearm. $15.00 fee for use of class guns to cover ammonium and maintance Bring a family member and get 10% off that enrollment. Larger group rates available. If you would like a private class at your home, business or club we'll do that as well. With 10 or more participants I will come to your location. I pay a referral fee to the organizer. A reasonable per diem and/or travel cost will be added for bookings outside the St. Louis, Missouri metro area. Call for details. ; Ph# 636-219-3935. Illinois residents are eligible for the Florida non-resident CCW's which is not valid in Illinois however it is recognized in Missouri & many other states. It's up to you to decide if the Florida CCW permit fits your needs. Speak with your instructor for more detailed information. Epehsians 6:13 Put on God's armor now! Then when the evil day comes, you will be able to resist the enemy's attacks; and after fighting to the end, you will still hold your ground. Here are some interesting facts for you. In 2007 there were 385 murders in Missouri. There were also 1,714 forcible rapes; 7,165 robberies; 20,418 assaults, and 43,446 burglaries. Not to mention 26,682 other violent crimes. In 2008 there were 461 homicides, 1,482 Forcible rapes, 124 attempted rapes, 7,389 robberies, 20,241 aggravated assaults, 45,620 burglaries and 29,710 violent crimes. The question is what can you do to keep from becoming a statistic? The answer is YOU can refuse to be a victim. The CCW Classes deal with firearms as items of self-defense and consequently a great deal is written about that subject. However, having to use a gun is not the ultimate form of defense. Not getting caught in a situation where a criminal has the opportunity to assault you is the ultimate in self-defense. This simply means avoiding areas and situations that have a high percentage chance of placing you in danger. Going into areas of town where crime is known to be high, stepping into volatile situations that do not involve you, allowing yourself to be isolated in a parking garage, in a park, or any place where other people are not in close proximity will increase your chance of criminal assault. This is something that’s within nearly everybody’s control and is the first and most effective step in your self-defense. But that being said Don't Be A Victim.... The world around us is changing. "Random" crime isn't so random any more. You need to be ready to protect yourself, and your loved ones. That's why a (CCW) Concealed Carry Weapon Permit makes sense. When trouble shows up, don’t be a victim. Now you've got more options. Some folks need the obvious stated. If an individual has ever been convicted, or is currently charged with, any felony do not enroll in a fire arms class. The same goes if an individual has been convicted or is currently charged with a misdemeanor crime of violence, domestic assault, or any crime against a child. I am currently a resident of the State of Missouri , or I am a member or a spouse of a member of the armed forces of the United States of America stationed in the State of Missouri; I am a citizen of the United States of America; I am at least 21years of age "21 as of 8/28/2011", 21 for the State of Florida;I have not plead guilty to or have been convicted of a crime punishable by imprisonment for a term exceeding one year under the laws of any state of the United States other then a crime classified under the laws of any state and punishable by a term of imprisonment of one year or less that does not involve an explosive weapon, firearm, firearm silencer, or gas gun; I have not been convicted of, pled guilty to, or entered pleas of nolo contendre to one or more misdemeanor offenses involving crimes of violence within a five year period immediately preceding this course for a certificate of qualification to obtain a concealed carry endorsement and I have not been convicted of two or more misdemeanor offenses involving driving while under the influence (BUT) of intoxicating liquor or drugs or the possession or abuse of a controlled substance within a five year period immediately preceding this course for a certificate of qualification to obtain a concealed carry endorsement.I am not a fugitive from justice or currently charged in an information or indictment with the commission of a crime punishable by imprisonment for a term exceeding one year under the laws of any state and punishable by a term of imprisonment of two years or less that does not involve an explosive weapon, firearm, firearm silencer, or gas gun; I have not been discharged under dishonorable conditions from the United States Armed Forces; I have not been judged mentally incompetent at the time of this course or for five years prior to taking this course and have not been committed to a mental health facility or similar institution in another state; I am not the named subject of an active ex parte order; I have not been convicted, recently arrested, or have charges pending against me concerning any crime of violence, spousal assault, elder abuse, or a crime against a child. If any of the above criminal or pending criminal situations is applicable to you, you should not continue with this concealed cany firearms course. The Sheriffs Office may deny you a Concealed Cany Fire Arms permit. If you are a convicted felon in any U. S. state, with either a civilian conviction or a military service conviction (Dishonorable Discharge), it is a crime to continue with this class and you may face subsequent arrest. No socialist, no communist, no anarchist, no antigovernment types. People like this work day and night to destroy American gun rights, and have no place here. For the concealed carry classes a person must be a resident of the State of Missouri for the Missouri permit. Florida issues non-resident permits to qualified applicants. Other factors may apply. Please contact us with any further questions. Let's work together to build a larger shooting community here in Missouri! Comments and insights encouraged. Comments moderated to assure a family friendly environment. "U.S. Concealed Carry - The Ultimate Resource for the Armed Citizen"
Disclaimer: I am not an attorney. I cannot nor will I dispense legal advice. Subjects discussed in any class are dispensed based soley on my opinion. I encourage you to seek professional legal advice after a class if you have further questions. It's better to be judged by 12 than carried by 6 The objective is to avoid both extremes! "Molon labe" is an ancient Greek expression for "Come and take them!"